A lavishly illustrated cookbook featuring 125 delicious, easy-to-prepare, revitalizing, and detoxifying recipes from the executive chef at North America’s largest yoga-based healing and education center NAMED ONE OF THE “NEW COOKBOOKS TO BUY THIS SPRING” BY EPICURIOUS • “An eminently useful resource for those looking to expand their repertoire of healthy dishes.”—Publishers Weekly The Kripalu Center for Yoga & Health, nestled in the Berkshire mountains of western Massachusetts, attracts more than fifty thousand people a year. Guests flock there not only to deepen their yoga practice but also to experience the healing power of its famously delicious food. Now you can bring Kripalu’s most popular dishes to your own table. Kripalu’s longtime and popular executive chef, Jeremy Rock Smith, embraces a mindful approach to eating and a seasonal approach to cooking. In The Kripalu Kitchen, he offers 125 easy-to-follow mouthwatering recipes, dozens of variations, and countless smart eating strategies designed for a variety of dietary preferences—from vegan and vegetarian to gluten-free, grain-free, dairy-free, and sugar-free. The 5-ingredient and 30-minute recipes ensure that even the busiest of us can enjoy this phenomenal food. Inside you’ll discover • Bountiful breakfasts: from Coconut French Toast with Thai Ginger Maple Syrup to Vegan Ginger Scones • Restorative preparations: from Kripalu’s famed Morning Broth to the traditional south Indian porridge Upma • Satisfying suppers: from Linguine with Pumpkin Sage “Alfredo” and Kale Pesto to Mushroom Cheesesteaks • Decadent desserts: from Gluten-Free Salted Double Chocolate Chip Cookies to Gluten-Free Whole-Grain Vegan Brownies to Gluten-Free Vegan Swami Kripalu Birthday Cake Honoring the wisdom of Ayurvedic healing practices, The Kripalu Kitchen also includes a simple test to determine your personal nutrition profile, or dosha, and every recipe is marked to guide you toward the optimal diet for your type. 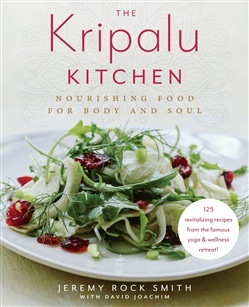 More than just a healthy cookbook, The Kripalu Kitchen will revitalize your body and nourish your soul. Acquista The Kripalu Kitchen in Epub: dopo aver letto l’ebook The Kripalu Kitchen di David Joachim, Jeremy Rock Smith ti invitiamo a lasciarci una Recensione qui sotto: sarà utile agli utenti che non abbiano ancora letto questo libro e che vogliano avere delle opinioni altrui. L’opinione su di un libro è molto soggettiva e per questo leggere eventuali recensioni negative non ci dovrà frenare dall’acquisto, anzi dovrà spingerci ad acquistare il libro in fretta per poter dire la nostra ed eventualmente smentire quanto commentato da altri, contribuendo ad arricchire più possibile i commenti e dare sempre più spunti di confronto al pubblico online.